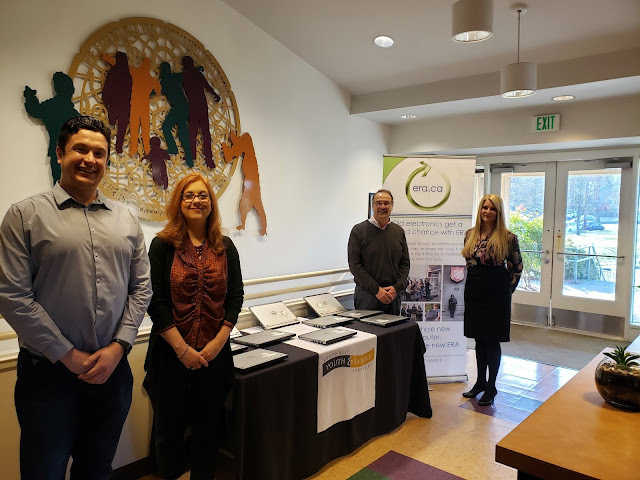 [April 1, 2019 Seattle, Washington] It was a close call for a local Seattle charity, which nearly received a dozen working laptops from a Canadian reuse organization last month. Fortunately, Basel Action Network was quick to intervene, notifying the charity by email that the working laptops - while free - were, in fact, used goods. "We try to sabotage these before they are handed out," said Executive Director Jim Phuckett. "Had these gotten into the hands of a needy person, they might have gone for years using the device, not even realizing they were accessing the internet and typing term papers using 'e-waste'!" Seattle local news zeroed in on the misleading reuse. This near-donation tragedy was averted by brave Hayley Palmer of Basel Action Network, who courageously notified the SWYFS.ORG nonprofit that the laptops being donated might not have been sabotaged. We are writing you today out of concern regarding your organization’s donation event in West Seattle tomorrow with ERA announced in the Virtual-Strategy Magazine article. We have also sent a message to this regard to the office of Councilmember Herbold. Basel Action Network is a global environmental justice watchdog group based here in Seattle that has been working for years on the issue of toxic trade and preventing rich countries from dumping their toxic waste on developing countries (see www.ban.org). In recent years we have exposed and documented the global electronic waste dumping trade. Most recently, BAN has been engaged in tracking illegal shipments of electronic waste using GPS tracking devices placed into old electronic equipment and then turning them into e-waste collectors and recyclers. One of our recent reports publicized on PBS and Seattle Times found that Total Reclaim, a Seattle based electronics recycler used by the City of Seattle, had exported the electronic waste they received to Hong Kong. We turned over this information to the State and the Federal government. The State prosecuted them, as did the federal government. Their sentencing on federal conspiracy/fraud charges for the export of toxic waste will be held next month (article here). BAN has been observing and documenting the actions of ERA’s Canadian locations for many years and publicly exposed their practices in the past through the Vancouver Sun (article here) and elsewhere. Most recently, BAN released a study that we conducted in Canada that brought to light ERA’s long history of electronic waste exports. Please find the link to the report here or on our website www.ban.org/trash-transparency and scroll down to our Canadian report. Now, as you are aware, ERA has just opened a location in Seattle. As you may know, the City of Seattle is an e-Stewards Enterprise city. e-Stewards was created by Basel Action Network to address the problem of unsustainable trade of toxic e-waste. It harnesses institutions, businesses, and cities to uphold the e-Stewards Standard – a safe, ethical, and globally responsible standard for e-waste recycling and refurbishment. This standard and certification promotes environmental justice on the global stage. We wanted to reach out to you and share our collected data so that your office is fully aware of ERA’s history before further endorsing or partnering with any of their activities. In full disclosure, ERA is currently suing BAN for exercising our First Amendment rights to alert the public and the Canadian government about these significant e-waste problems. Please feel free to reach out to us if you have any questions or if you feel we could be of any further service to you. So the NGO in Seattle - Basel Action Network - announces that it has sabotaged donations to ERA in Canada. Now, the NGO is warning local Seattle charities that they are receiving laptops from an organisation that is suing BAN for sabotaging donations to it. Because the donated computers might be sabotaged. Wait, is this April Fools? Umm. Post March 31... Truth is stranger than friction. All Seattle residents who may be using a computer or laptop which was NOT sold to them by one of the OEMs who fund Basel Action Network should be warned that they may be successfully using a device NOT previously sabotaged, and therefore - like the ones BAN objects to - may be illegitimate. There is a lawsuit, referred to by Hayley Palmer in the email, between ERA and BAN, but the placement of GPS devices at ERA sites in Canada (14% of all deployments), and intervention in the donation to the Seattle charity surely has nothing at all to do with the lawsuits, according to a the Basel Action Network 501(c)-3 charitable organization's commission based consultant. Friends, today is the 9th anniversary of the blog's very first April Fools Day post "Ingenthron hired by Basel Action Network", which remained many peoples favorite post for many years. In the comment section, I was roundly criticized by BAN's consultant Donald Summers, who later sent a vicious attack on my character to a Chicago Patch reporter.